This is a guest post by Anastasia Bow-Bertrand, Kristine Briones, and Marta Favara from the Young Lives study at the University of Oxford. Over the past two decades, the Ethiopian government has shown a strong commitment to education sector development, making significant strides in terms of access to education and opportunities to learn. This endeavour has received global attention. In 2008, Ethiopia was identified in the Education for All (EFA) Global Monitoring Report1 as one of the countries that has seen the most rapid progress towards the Framework for Action goals agreed in Dakar in 2000, notably universal enrollment and gender parity at the primary level. The Young Lives study has been core-funded by the UK’s Department for International Development and aims to provide policy-relevant findings over the life course of children living in poverty, in line with the global sustainable development agenda. Since 2002, Young Lives has followed the lives of 12,000 children in two age cohorts (4,000 &apos;Older Cohort&apos; children born in 1994/95 and 8,000 &apos;Younger Cohort&apos; children born in 2001/02) from different social, religious, ethnic and language groups across rural and urban sites in four countries, including Ethiopia. 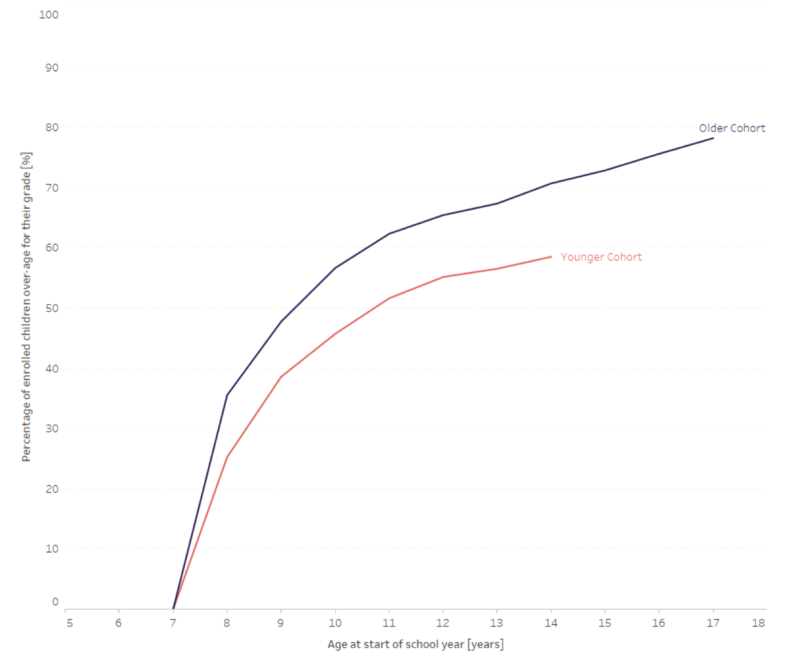 Through its unique multi-cohort design, Young Lives data permit exploration of the determining factors of educational progress (individually and nationally) and cognitive development over a crucial period in the history of the Ethiopian education system. 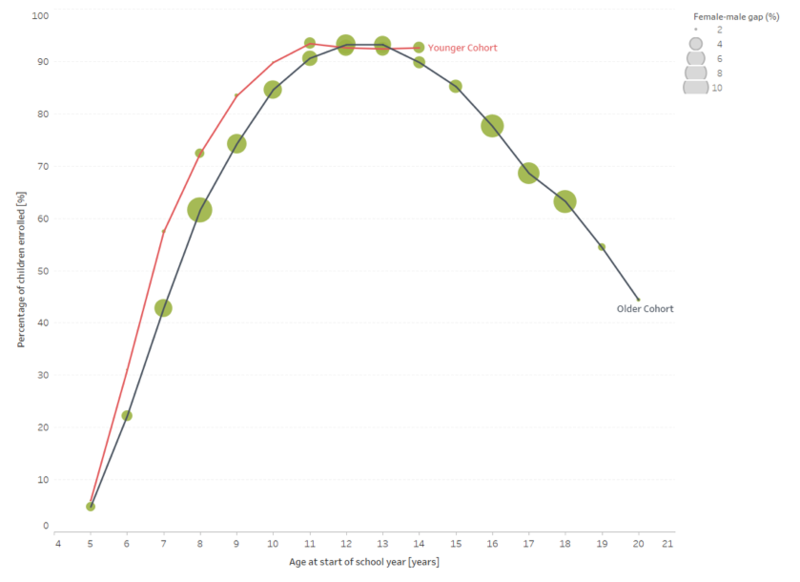 Furthermore, the five rounds of data collection span the children&apos;s education cycle from the age of primary-school enrolment to an age when they typically make their transition into tertiary education (or they have already dropped out of school) and enter the labour market, so offering a rich insight into the drivers, motivators and influences on educational trajectories over a 15-year period. Young Lives children have high hopes for their education, as the chart below shows. At the age of 12, 73 per cent of children aspire to complete university. However, children living in the poorest families have substantially lower educational aspirations than children from the less poor households. So too, aspirations decrease as children grow up. Between the ages of 12 and 19, children’s aspirations change significantly and they tend to adjust their aspirations downward in line with their lived reality and their perception of the opportunities available to them.12 There is a marked inflection point at the age of 15, the same age at which the drop-out rate increases. Notably, after the age of 15, the gender gap in aspiration shifts in favour of girls, mirroring the higher drop-out rate among boys after the age of 15. Note: Each point in the graph corresponds to the proportion of children aspiring to go to university at age 12,15 and 19, including both those enrolled at school or no longer at school. While grade progression remains slow, learning poor, and aspirations frequently unmet, there has also been noticeable intergenerational progress between Young Lives children and their parents, at least in children attaining higher school grades. The chart below compares the percentage of Young Lives parents and children who achieved post-secondary education across a number of sub-groups defined by gender, socio-economic status, location and region of residency. On average, 25 per cent of 22-year-olds are currently enrolled or have finished post-secondary education compared to 6 per cent of their parents.14 Once again, the greatest improvements are documented among individuals from better-off households and those in urban sites. As the Young Lives study reaches its final phase of core-funding, we are drawing together our education findings from Ethiopia and across all study countries to define principles for policy and programming, available here. The above discussion draws on Young Lives data from all five survey rounds. For data visualizations and interactive delineations of this dataset, please visit our website and follow developments @yloxford with #YLdataviz and #YLEducation. UNESCO (2007) – Education for all by 2015: Will we make it? Global Monitoring Report 2008, Paris: UNESCO Publishing. Woldehanna, T. and M. Araya (2016) – Education inequalities among children and young people in Ethiopia. Young Lives Country Report. Woldehanna, T. A. Mekonnen, N. Jones, B. Tefera, J. Seager, T. Alemu, G. Asgedom (2005) Education choices in Ethiopia: What determines whether poor households send their children to school? Young Lives Working Paper 15. Tafere, Y. and N. Chuta (2016) Gendered trajectories of young people through school, work and marriage in Ethiopia. Young Lives Working Paper 155. Favara, M. (2017) Do dreams come true? Aspirations and educational attainments of Ethiopian boys and girls, Journal of African Economies, 26(5):561-583. 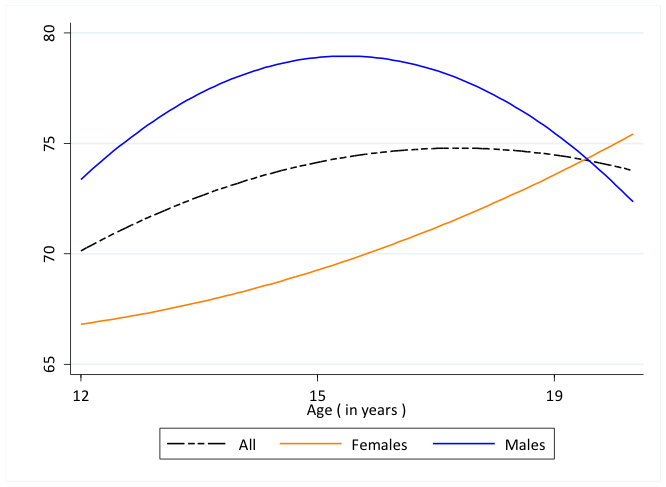 Children from the middle tercile households have experienced the biggest decrease in over-age enrollment from 76% over-aged 14-year-olds in the Older Cohort to 55% over-aged 14-year-olds in the Younger Cohort. Young Lives (2017) Education and learning: Preliminary findings from the 2016 Young Lives Survey (Round 5): Ethiopia. 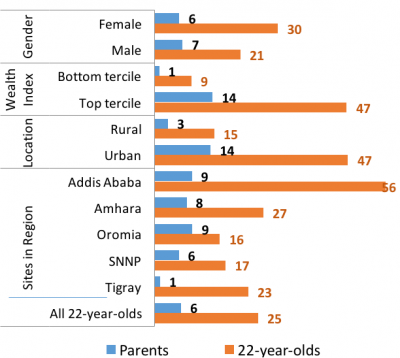 Young Lives (2018) Poverty and intergenerational change: Preliminary findings from the 2016 Young Lives Survey (Round 5): Ethiopia.